Was Cần Thơ named Bassac? Cửu Long, the Mekong in Vietnamese, means Nine Dragons. In Vietnamese, the Mekong is called "Cửu Long", which is Sino-Vietnamese for Nine Dragons, after the number of its mouths, but as you try and count the branches of the Mekong that actually reach the sea today, nine is one of the few numbers you will not reach. The dragons are moving. See also a history of the River Shipping Co. of Cochinchina, which traded these waters. When we named our boats the Bassac, we were referring to the older name of river Hậu Giang, the second but larger branch of the Mekong, that originally splits from the main Mekong flow at Phnom Penh, and then grows into its largest tributary. 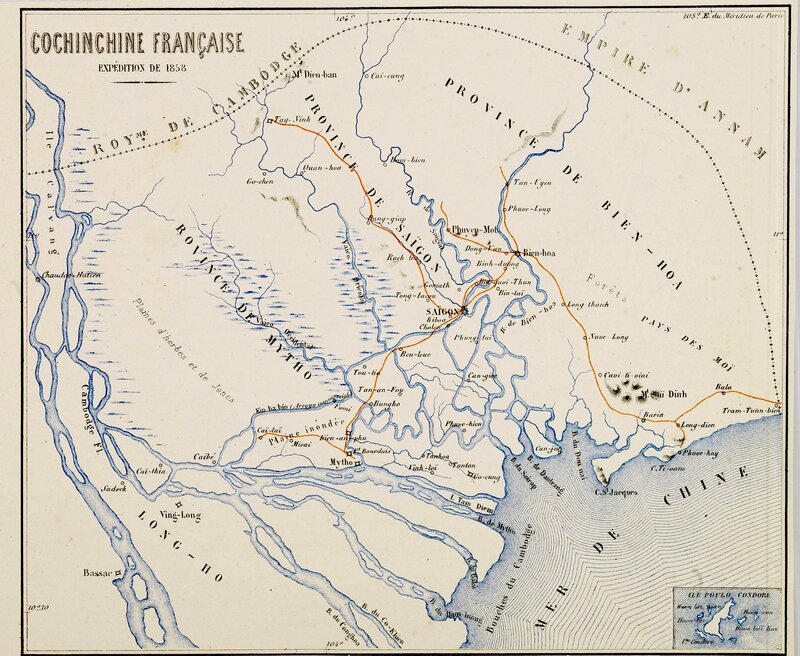 According to this map, it seems the name Bassac may have originally been given to the town of Cần Thơ, our home. Could it have then evolved into the name of the river? This very map shows very clearly how the topography of the delta evolved: we can see how the connection of Măng Thít river was protected by being inside the long curve of Cồ Chiên and is essentielly the same today; we also can see how Bình Hòa Phước used to be an island --today a long peninsula crossed by Chợ Lách canal. The map shows in red the primary waterways, and in blue local waterways. 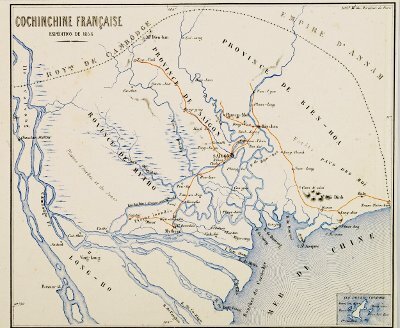 There is a passage at Chợ Lách, between Cái Bè and Cổ Chiên river, and the Kiên Lương canal was already between Châu Đốc and Hà Tiên on the Gulf of Siam. Many waterways that were deemed of general interest are now limited in air draft by low bridges, and only run by smaller freighters, as for instance the straighter way from Bạc Liêu to Mỹ Tho. 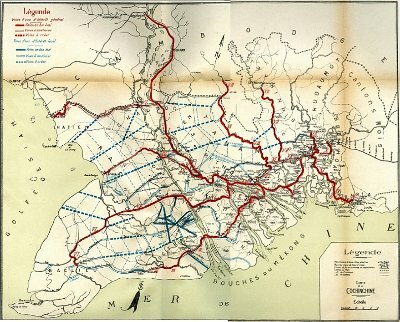 In dotted lines on the map are the canals that the colonial administration planned to dig at that time. With the advent of 1925 and the beginning of social unrest, many of these canals were never built. And some as well should not, like a canal from between Long Xuyên and Châu Đốc that would have met the sea halfway from Rạch Gía to Hà Tiên, where there is nothing. The present day Kênh Rạch Sỏi makes much better sense. 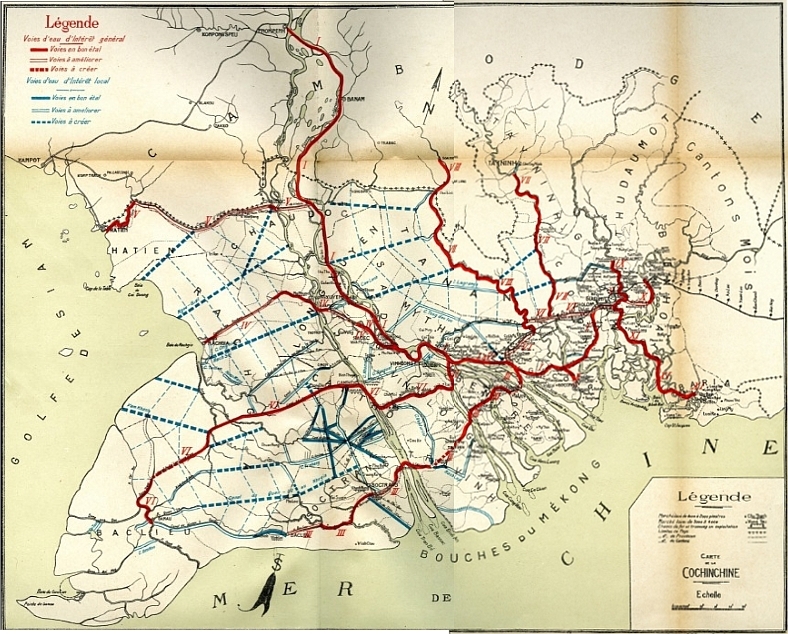 An extended network of local canals and waterways shows in blue on the map, although mostly in dotted lines, so as projects at that time. It is quite noteworthy that most of the larger existing canals of local interest as drawn on the map lead to the same place: Phụng Hiệp, about 35 km South of Cần Thơ, and which still hosts today one of the largest floating markets of all: Ngã Bảy, which means 7-ways crossroads (see a satellite picture). 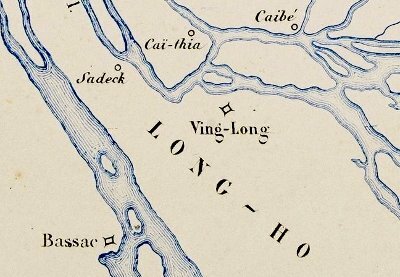 If the map is complete enough and reliable, it hints that Phụng Hiệp may have been quite an important commercial place at that time. 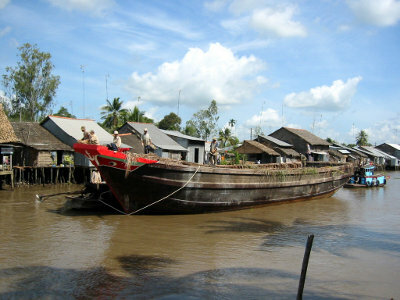 Once stripped of its original cabin and overboard flanks, this rice freighter is being pulled free of bridges on a canal in Phụng Hiệp before it becomes Bassac I, in 2003. David Biggs1, arguably today's historian most knowledgeable of the Mekong delta, has dug out court cases showing we in fact owe the French engineers the numerous canals leading to Phụng Hiệp: the later ones having been dug under legal pressure from the local land owners to try and alleviate recurrent floods brought to the area by the former ones. On the way from Cần Thơ to Cái Bè or back, we run along Măng Thít river and Nicolai canal. 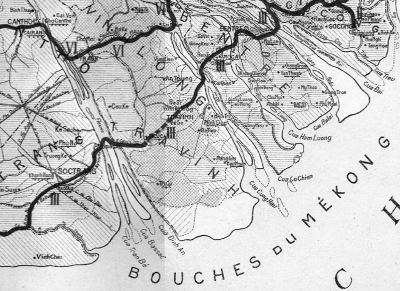 Both were present in the early XXth Century, as we see on this map dated about 1910. The Nicolai canal was then named Trà Ôn, after the town at its confluent with the Bassac, behind Cù Lao Mây, where we stop for floating markets on the way to Cần Thơ in the early morning. It is much straighter than a river, which not only makes it faster to cross, but also protects it against the sheer force of erosion. Where the path becomes a winding river, we reach Măng Thít, still a very beautiful sight today. The meanders of Măng Thít river evolve year after year and are more marked today than they were then: silt settles on the inside of curves, whereas the water erodes the outer bank of a meander, carving it out in the long run. The map actually shows a meander so bent that a shortcut appeared or maybe was dug, leaving out the loop of the river.